Introducing: Top 20 peer-to-peer events in The Netherlands. Inspired by the “Day of Philanthropy” presented by the VU University of Amsterdam last week on the status of philanthropy in the Netherlands, we decided it was a good time to release our report about the state of Dutch peer-to-peer fundraising events and reveal the list of the Top 20 events in 2014. 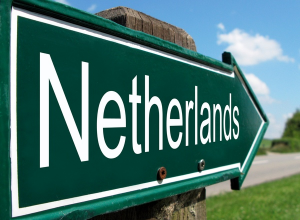 While peer-to-peer events are relatively new to the European fundraising landscape, this form of fundraising is already showing signs of greatness in the Netherlands. By presenting this study we hope to give you a better understanding of the “health” of the Dutch event fundraising industry, as well as provide an indication of a globaltrend. 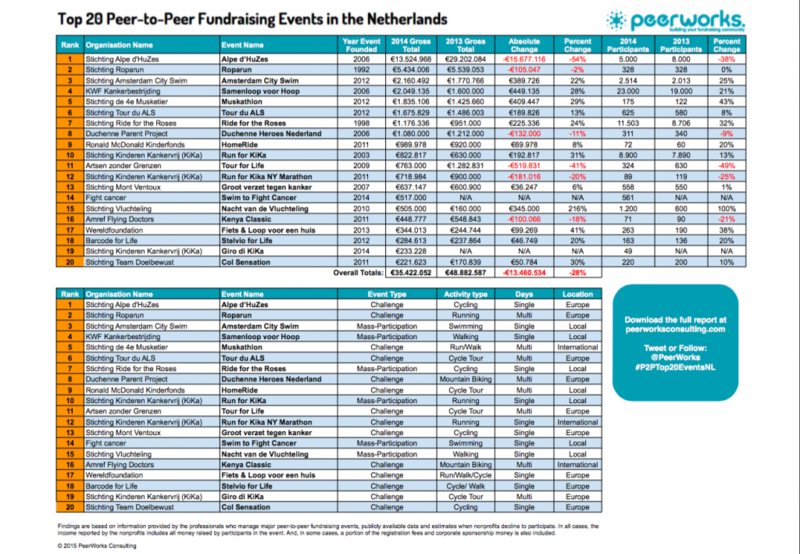 Despite its size, the Netherlands has really harnessed the power of peer-to-peer event fundraising…and they seem to be following in the footsteps of event fundraising “giants” like the US and UK. In 2014, the Top 20 events in the Netherlands raised a whopping €35 million. Taking the number one position with the highest revenue result was the Alpe d’HuZes…which generated an impressive €13 million with their one-day cycle event. And, the average amount raised per event in the Top 20 was €1.768.902! What’s also exciting is that two events made it on to the Top 20 list in their inauguralyear–Swim to Fight Cancer (#14 with €517.000) and Giro di KiKa (#19 with €233.228). Looking at year-over-year revenue growth, there were also some big wins, including the Run for KiKa (up 31%) and Samenloop voor Hoop (up 28%), both of which achieve significant revenue by being a national event series. Excluding the Alpe d’HuZes (which maintained its #1 position despite suffering a 54% loss), the year-over-year revenue of the other Top 20 events grew 11% in 2014. Well done Netherlands! This is an encouraging statistic because it illustrates growth in peer-to-peer fundraising events early on. More “wins” on the horizon. It wasn’t surprising to see that almost all of the Dutch Top 20 events benefitted health-related causes. That’s usually the case everywhereas events give people a way to show support for a loved who is suffering from a health issue. However, a large proportion of the Dutch Top 20 events are cancer-related compared to the US and UK where there’s a much wider range of causes benefitting from events like heart disease, lung disease, MS, Alzheimer’s and autism. This tells us that there’s an opportunity for more Dutch health charities to “get in the game” and score some big wins. Nonprofits don’t haveto be health-focused in order to have a highly successful event. Opportunities exist in the Netherlands (and elsewhere) for social and environmentally-focused nonprofits to consider a peer-to-peer fundraising event. We look forward to seeing which ones appear on our Top 20 list in the future! Finally, our extensive research shows that Dutch nonprofits are making their events harder than they need to be and not really capitalising on the full fundraising potential of their communities…leaving a lotof money on the table. Our full report explains what the Dutch (and other countries) can do to ensure they get the most return from their investment in events. Yes, it’s true that practically everyweekend in nearly everyUS city there’s a 5K run/walk benefitting everykind of charity. But what the rest of the world may not realize is that it hasn’t always been that way. Just as it was done in the US, the Dutch nonprofits are essentially creatinga culture that allows people to participate in fundraising events. The more events that Dutch charities produce and promote, the more people participate, ..and get used to participating. The more they ask those participants to fundraise, the more they ask for donations…and get comfortable asking. The more those friends, family members and colleagues are asked for a donation from a participant, the more they give…and get comfortable giving. So while there isn’t a fundraising event everyweekend in everycity in the Netherlands, the more fundraising events that are happening, the more “normal” it will become. Those organizations listed in the Dutch Top 20 are leading the charge in creating their event fundraising culture and are proving that same culture can be created (and thrive!) anywherewhen charities decide to invest in it. Of course, creating an event fundraising culture takes time. (It took about 30 years in the US.) The good news is that European countries are significantly smaller and best practices about peer-to-peer fundraising are easily found in blogs, forums and studies like this. That said, we’d expect the peer-to-peer fundraising culture to spread much more quickly here in Europe than it did in the US. The 2014 results in the Netherlands are impressive, but it’s just the beginning…and we are excited to see how the Dutch Top 20 looks next year! In the meantime, we are proud that the Dutch are setting such a good example…proving that good things arehappening (and canhappen!) in the world of peer-to-peer event fundraising.